The aim of the guide is to provide its readers with the information they need to make key decisions about the films they want to make, and avoid common pitfalls that many groups experience. From planning a project, to shooting safely on location, editing and sharing the film, as well as the process of managing making a film in a group, are all covered. The guide includes games that teach basic camera shots and introduces fun ways to evaluate projects using film. It includes handy check lists and examples of paperwork, including a project brief and consent forms. Participants can use this guide themselves, or refer to it together with teachers or youth workers. It’s in book form, so groups can take it with them on location. 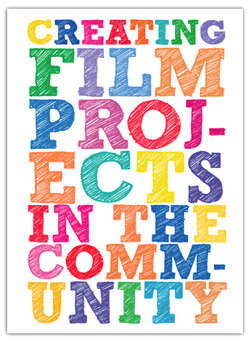 Lizzie Sykes’ book on ‘Creating Film Projects’ in the Community is an excellent well-written guide for students on everything to do with the film making process. Included are Pre-Production and Planning tips, advice on Health and Safety, Fundraising and Project Management, Recording Sound, a sample Budget Sheet, Types of Shot and much more. It would be a very useful addition to any individual or group of students about to embark on a film making piece of coursework or project. It’s pitched for GCSE and upwards with a key strength being the way the writer addresses the reader e.g. “It can take time to gather the funds you need….make sure you have a designated person on your project who fills in risk assessment forms….the camera operator films the shots the director has prepared. They might also have some lights to use to brighten up a space that is too dark…if you spend time planning, the rest of the process is more fun and less problematic”. It’s a very clear, accessible and enabling guide. At £25.20+VAT (inc. UK postage + packaging), it will make an invaluable and affordable addition to your production tool kit. To order your copy of Lizzie’s guide, get in touch with Edusites using the contact information included below and we’ll send you an invoice and payment instructions. You can pay by card, bacs or cheque.